This is the first book on social capital and trust informed by a critical geographical perspective. 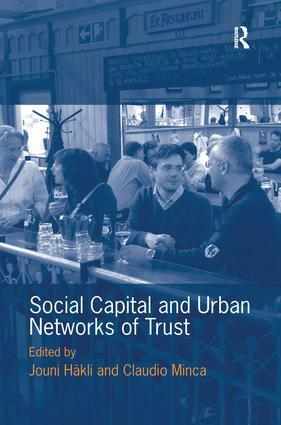 The authors examine the role of social capital in the constitution and reproduction of urban networks of trust in different places and contexts. They explore how social capital and trust are reflected in the capacity of these networks to achieve their goals and to deliver specific forms of urban development in a number of Finnish and Italian cities. Finland and Italy present, in many ways, two almost paradigmatic cases of how social capital and trust can work in extremely different and yet very effective ways in the production of the urban. They are two almost ideal laboratories for experimenting new definitions and new understandings of the concepts in question. Contents: Introduction, Jouni HÃ¤kli and Claudio Minca; Part 1 Re-Placing Social Capital: Geographies of trust, Jouni HÃ¤kli; Searching for social capital, Mauro Cannone; The 'magic and loss' of social capital and local development, Paolo Giaccaria. Part 2 Grounding Networks: Re-scaling Trieste: (not so) invisible networks, (dis)trust and the imaginary landscapes of the Expo 2008, Guiseppe Porcaro and Claudio Minca; Trust in translation: the role of place and vision in building the eTampere programme network, Timo Poutiainen and Joumi HÃ¤kli; Networks and trust in Venice: the port as social agent, Stefano Soriani. Part 3 Mobilising Trust: Speaking Triestino: language, practice and social capital in Trieste, Claudio Minca; Boundaries of trust: building a transnational space in Harparanda-Tornio, Jouni HÃ¤kli; All that is solid does not melt into air: (re-placing) social capital in Venice's urban development, Mauro Cannone; New and old associations as trusting networks: tracing social capital in JyvÃ¤skylÃ¤, Martti SiisiÃ¤inen; Index. Jouni HÃ¤kli is a Professor in the Department of Regional Studies, University of Tampere, Finland and Claudio Minca is a Professor in the Department of Geography, Royal Holloway, University of London, UK.